What's special about Roadmaster's All Terrain Tow Bars? Releasing your towed vehicle is easy with Roadmaster's All Terrain tow bars even when the tow bar is at a hard angle, or the towed vehicle is out of level. Four familiar, classic Roadmaster tow bars: the StowMaster, Falcon, BlackHawk and new for 2006, the Sterling are available in the All Terrain series. Each is upgraded with Roadmaster's exclusive Freedom Latch, which releases the tow bar at any angle, level or bind first time, every time. Simply fold the All Terrain tow bar toward the motorhome and the storage latch will click, automatically locking it in place. When you're ready to tow, just bring the tow bar up and press the storage latch to release the lock. The safety cables and electrical wiring cord are both routed through the built-in channel guides.No need to wrap the cables or wiring. With the BlackHawk, hooking up and disconnecting has never been easier. As you drive the motor home away, the arms will extend, center and automatically lock. Brackets (sometimes called Base Plates) made to fit the specific towed vehicle are required (sold separately) to connect the Tow Bar to the frame of the towed vehicle. Standard Bracket - Economical but visible; good for many light weight and average low profile tow cars. XL - Widely used for a variety of tow vehicles and are almost totally hidden. EZ - Hidden twistlock design available for many smaller cars. MX and MS - Specifically for vehicles with heavy-duty frames such as the Suburban and full-size pick-ups. Please note that example brackets are shown for pricing guidance. However, brackets must be matched to the specific application. The Roadmaster Website has additional details and information on types of towbar brackets.Use the bracket search feature to find brackets for your specific application. This link to general information on types of towbars provides good background education. All links above will open in new browser windows. Simply close each window to return here. The heavy-duty, black marine quality vinyl cover will help protect your unit and provide an improved look when not using. Safety cables are required in case the tow bar becomes unhooked. Note: You must use the heavy duty 8000 lb Safety cables for the BlackHawk. Coil wiring kits make installation easy and neat. In most cases you should also order a bulb and socket kit. Please ask about these items when ordering. A supplemental towed car braking system is highly recommended and is legally required by many states. 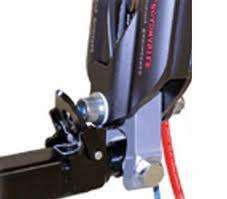 Check out the popular and easy to use Brake Buddy braking system. Protect your investment with locking hitch pins and base plate locks. If you stop for lunch and don't take the keys out of your towed vehicle, it's not a great feat for someone to steal it and/or your valuable tow bar. The 3-lock set is keyed alike. Click here.